A line-drawn rooster and diagram illustrating where specific feathers that fly tiers use come from on the bird’s body. I saw this old, or what seemed to me to be old, image on facebook this morning, and right away, thought to myself, ” I get these questions a lot.” Good numbers of people in my classes or folks I speak with at shows and fly tying demos don’t know where on a bird certain feathers come from. Or they don’t know the difference between neck hackles, saddle hackle, or hen back feathers. The saddle hackles on a hen might be called ‘saddle hackles’ but are more often called ‘hen back’ feathers. The spade hackles on a rooster are merely wide ‘hen back’ feathers on a hen that have very long webby fibers. 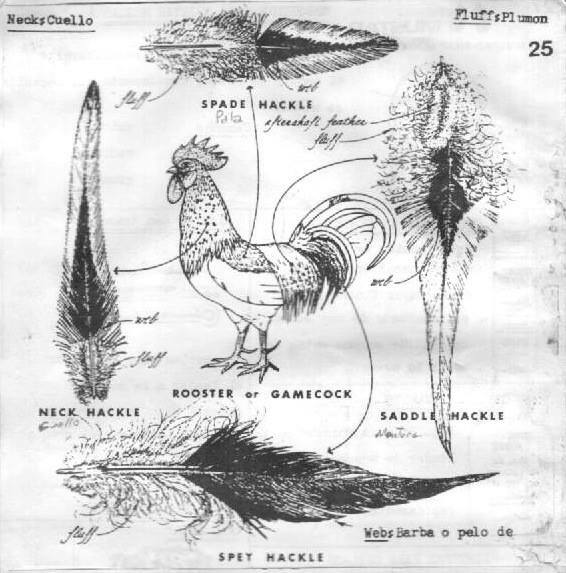 And the spey hackle on the rooster is also called ‘schlappen.’ Note in particular, the well-illustrated differences in the comparative shapes of the neck, saddle, spade, and spey feathers. A similar ‘shape difference’ applies to hen feathers as well, neck vs. saddle, with all the hen feathers being shorter and more webby that those same feathers from a rooster.